Sustainability are the environment and key topics for companies throughout the world - it is the same at Würth Elektronik. Environmental protection is an inherent part of the company philosophy and is actively followed by the employees in the Group. We work together to keep our impact on the environment to an absolute minimum. Our environmental management is part of our Integrated Management System (IMS). It supplements quality management and thus has a direct and sustainable effect on workflows and processes in the company. An important environmental target at Würth Elektronik is to reduce our environmental impacts to a minimum through targeted procurement and by using raw materials and resources carefully. We demand that our key suppliers have an environmental management system according to DIN 14001 and we regularly assess our suppliers, also in terms of their environmental behavior. We control our orders of products and raw materials in a needs-based manner. We are continuously developing new processes to make circuit boards smaller and lighter without reducing their performance or efficiency.We are continuously developing new processes to make circuit boards smaller and lighter without reducing their performance or efficiency. Back in 2002, we developed TWINflex®, a more environmentally friendly foil printed circuit board using pollutionfree and reusable materials. We consistently use innovative circuit board technologies that allow us to save resources. As regards the use of hazardous materials, we are committed to a clear avoidance strategy. We are continuously looking for alternative materials and we substitute components with a high hazardous substance potential. We have the option to use only substances that are registered according to REACH and that are approved according to statutory regulations, such as RoHS, the German Chemicals Prohibition Ordinance, or the German Chemicals Law. We have been offering alternatives to leadbased soldering processes since 1996. At Würth Elektronik, we are using an energy management system according to DIN EN ISO 50001. Due to the energy monitoring system, the energy consumption by individual systems can be analyzed. Through the continuous expansion of this system and the transparency in our energy consumption, we can rapidly and effective take measures to reduce our carbon footprint. Compressed air is one of the most expensive forms of energy. Würth Elektronik has taken specific measures to considerably reduce energy losses in its compressed air systems. Refrigeration and air conditioning are other big energy consumers. The entire cooling systems are regularly tested for efficiency and adequacy and are replaced when required. Electricity-intensive refrigeration machines and air conditioning systems are used only when the outdoor temperature exceeds a defined level. When we renovate our energy systems and in our new buildings we go far beyond the statutory specifications. In new buildings we use the latest technologies for refrigeration and air conditioning systems. We feed the waste heat from our existing compressors and the production machines directly into the heating system. We record our consumption of electricity, water, heating and cooling energy, gas and oil and develop an efficient energy control program. Würth Elektronik uses renewable energies to generate electricity where possible. The aim is, based on the current water consumption, to reduce it even more over the coming years. Water consumption in the circuit board plants of the Würth Elektronik Group has been drastically reduced over 15 years through investments in intelligent production and the successive introduction of cascada rinsing. High-quality sterile water is needed in the production of circuit boards. Therefore, drinking water is first fed through the machine cooling system, as a „refrigerant” where it is heated and then prepared for the process (desalinated). To reduce the feed of fresh water and the discharge of wastewater Würth Elektronik tries to ensure that water is used optimally. The systems with a light burden of metal products are fed to a conventional wastewater treatment system. Wastewater with high metal burdens and complex wastewater are additionally subject to biological treatment. The wastewater from the two treatment systems that flows into the natural water system is well below the statutory limit values. Through the rinsing processes heavy metals, mainly copper, get into the water. This polluted water is cleaned in the company’s own wastewater treatment systems. In every production plant exhaust air and noise have an impact on the environment. Over the last years, Würth Elektronik has invested heavily in constructional measures for soundproofing and for cleaning exhaust air. At all our locations, we remain well below the limit values for noise emissions. Würth Elektronik constantly maintains active contact with municipal and city administrations and with various authorities and institutions and seeks constructive cooperation. The drilling and milling dust in the production process is collected in FIBCs via a central vacuum system and is then recycled. Depending on the content, the exhaust air from the process machines is fed to different scrubbers so that it can be separated and cleaned reliably. A modern biofilter is used especially for exhaust air containing solvents; the remaining volatile organic compounds (VOC) are then filtered out in this system. VOCs are also responsible for summer smog. In summer they cause ozone to form close to the ground. High ozone levels are harmful for humans, flora and fauna. With the biofilter, Würth Elektronik has reduced emissions of air containing VOCs to a fraction per cubic meter. 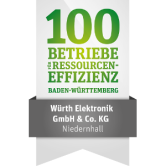 Würth Elektronik always pursues a waste prevention strategy. Consumption of raw materials and resources is reduced to a minimum. We use every single possibility to reduce all forms of consumption. Würth Elektronik started recycling residual materials at a very early stage. Today, 97 percent of all waste produced in the circuit board plants is recycled. Waste is separated at the company‘s own recycling station and is recycled or disposed of by certified disposal companies. The waste is separated down to very small parts, such as batteries, fluorescent tubes, rechargeable batteries, plastics, wood, etc. The better the individual fractions are separated, the more effectively they can be reused. Most of the etching materials used in the process, such as hydrochloric acid or copper salts, are reused in other areas of the process system. Recyclable metal-based solutions are reprocessed. Salt solutions that we can no longer use are sent directly to other industries, where they are used in other processes. We collect precious metals, separated according to fractions. Wastewater sludge containing metals is reprocessed, the remainder is fed to a thermal recycling system or taken to land fill sites.